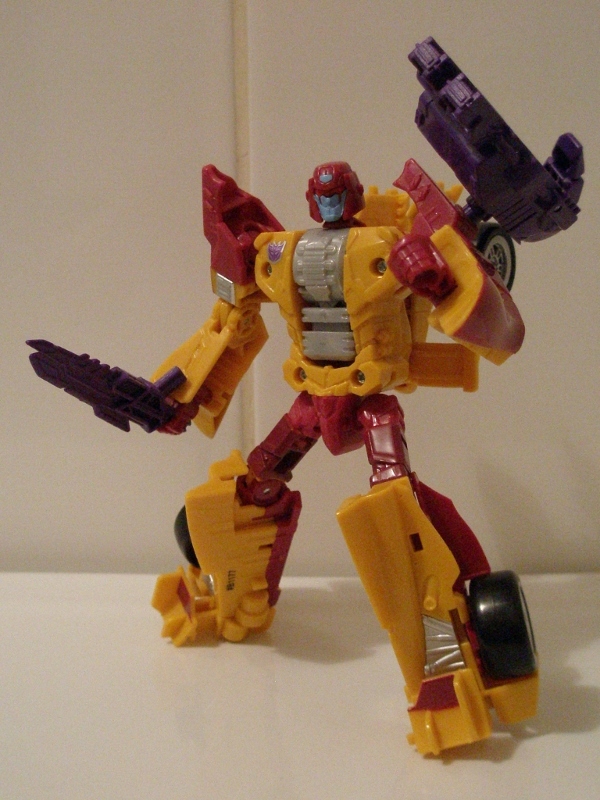 Bio: Nasty, underhanded, Dragstrip loves to gloat over his victories. He would rather be scrapped than lose. Prone to overheating. Megatron would sooner melt him than talk to him, but knows he's even worse company for the Autobots. In car Mode, has a plasma-energy blaster. Carries a gravity-enhancing gravito-sword. Combines with fellow Stunticons to form "Menasor". The Stunticons are one of my favourite bunch of Transformers characters. They're such a wild and uncontrollable bunch of anti-social herberts, they make a neat terrorist cell among the Decepticon ranks. They were also notable for being the first Decepticons to have the sort of sporty ground-based alt modes that were usually the preserve of the Autobots. 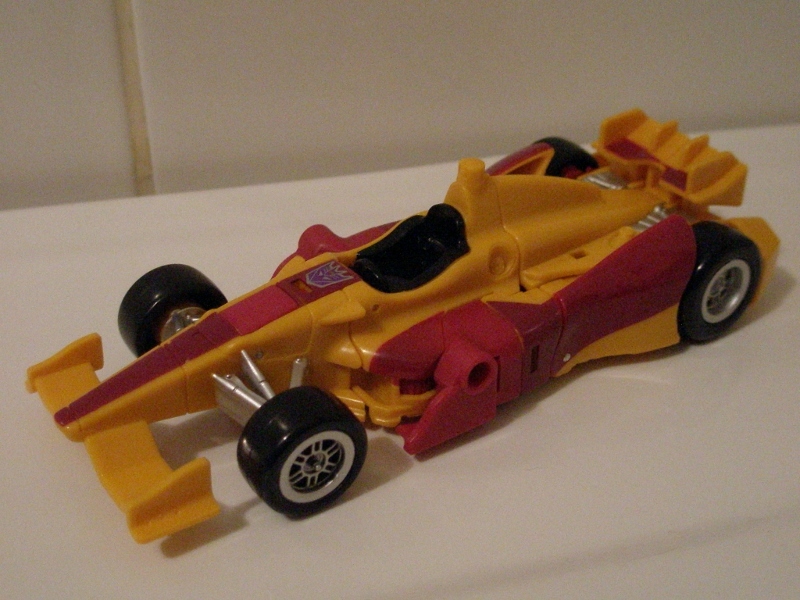 Whilst the others all got swish looking road-legal vehicles, Drag strip got lumbered with being a racing car. Which is fine, and suits his competitive streak, but does mean that like Mirage, he's a bit useless at being 'in disguise'. Unless some F1 style plot is unleashed on the world of Transformers. And I doubt the usual sports-related bribery and corruption would be the kind of thing of interest to giant outer-space robots. Maffia-style protection rackets, like the one the Autobots struck with Blackrock are much more their bag. Dragstrip himself is cropping up for the second time in the world of fan sop Transformers toys, having gotten a Universe toy from the Classics Mirage mould some years back. Only that one couldn't combine so it was obviously rubbish. It was also kind of bland, done out all in yellow. Being a simple repaint, he also missed his Tyrell six-wheeled alt mode, and numerous customs out there confirmed that you couldn't jam an extra set of wheels into that slick wedge and make it look good. And now, we're having another go as Hasbro finally gets around to responding to the plethora of Third Party gestalts that have popped up like worms after the rain in recent years. 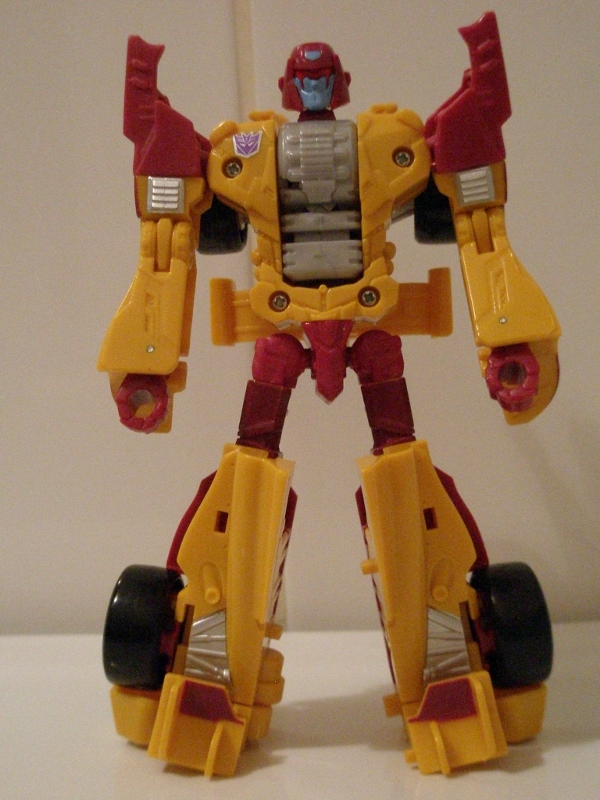 Robot Mode: There's something a bit disco about Dragstrip's robot mode,. He's all flares and '70s wedge shapes and looks like an extra from Saturday Night Fever wearing a Devo-style plant pot hat. His shape instantly brings to mind wide lapelled suits and flared trousers. Thanks to his grey combiner barrel chest, he also looks like his shirt is open and he should be sporting a medallion. Its not a good look, truth be told, with his be gaping sleeve arms and truncated spoiler stump feet. The mustard yellow is a spot on update of the original livery, but I can't say I'm overly keen on the dried blood maroon he's got going on. The screw hole placement is unfortunate too, making him look a bit like you've somehow transformed him wrong. At least the original Special Teams toys had a bunch of stickers to cover up this sort of thing. Here, its all on show, for better or worse. 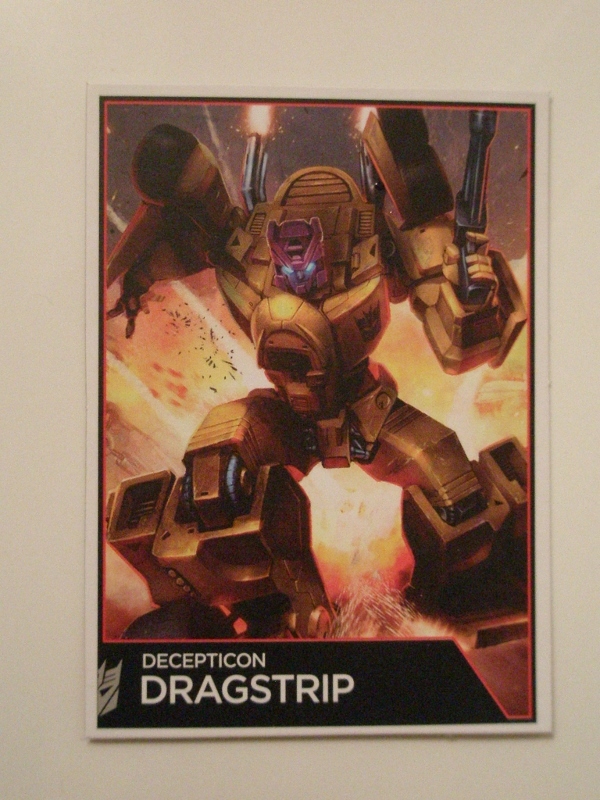 In addition to his unfortunate fashion choice, Dragstrip has the most chinny head I've seen this side of Animated. It looks like his whole face should fill that area of blue, but no. He has this weird tiny shrunken set of facial features and then the rest is CHIN. Its kind of ugly to look at, making Dragstrip look like some kind of lumpen school yard bully dressed up for the end of year disco. He also has what I can only describe as the Transformers rattle. This curious affliction is present on a a lot of current Transformers toys in that the cheapness of their construction gives them this curious 'clack' whenever you handle them. If nothing else though, he's decently proportioned and is solid enough in robot mode. Sword annoys me too, as its got an angled hilt. This is so the robot can hold it like a gun, because that's a thing these days, but it means you can't plug it in for storage anywhere as it points off at an angle and looks cack. Alternate Mode: Sadly, the Tyrell P34 alt mode has been jettisoned in favour of an approximation of a modern F1 race car. I say approximation, as real world F1 cars these days have eschewed much of their bodywork in favour of being some sort of areodynamic piece of origami tinfoil, which means poor Dragstrip is on a hiding to nothing trying to recreate that look. Instead, what we have here is a passable stab at a race car, somewhere between the the more blocky stylings of the twentieth century and today's low slung go-karts. It's alright, but I can't say I'm hugely fond of it. I've also found Hasbro's corner cutting with the wheels (they're clipped on, rather than pinned or on an axle) is deeply unpleasant. He doesn't roll well and it looks like what it so obviously is : cheap. His daft clip on fist cannon makes for a slightly goofy attack mode too. 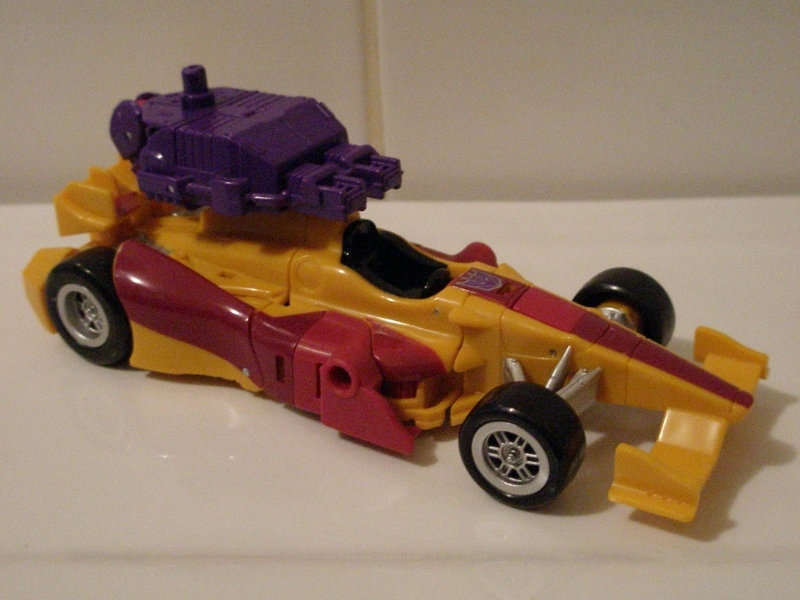 Mainly because Drag Strip's fist cannons (and how weird is it to say that) don't look like, well, cannons and just some weird nubbins sticking out of a purple block of cheese.